It is surprisingly hard to find a good recording of Go Down Moses. You can hear the pain of black slavery in every note of this version by Doris Akers. And God said to Abraham, "As for Sarai your wife, you shall not call her name Sarai, but Sarah shall be her name. I will bless her, and moreover, I will give you a son by her. I will bless her, and she shall become nations; kings of peoples shall come from her." Then Abraham fell on his face and laughed and said to himself, "Shall a child be born to a man who is a hundred years old? Shall Sarah, who is ninety years old, bear a child?" And Abraham said to God, "Oh that Ishmael might live before you!" As for Ishmael, I have heard you; behold, I have blessed him and will make him fruitful and multiply him greatly. He shall father twelve princes, and I will make him into a great nation. But I will establish my covenant with Isaac, whom Sarah shall bear to you at this time next year." As He did with Abraham, God gives Sarai a new name that sounds similar to the old one but has a different meaning. "Sarah" means "princess"; this accords with her new role, as the mother of God's nation. Nobody is completely certain what "Sarai" means or even what language it came from; it could be Akkadian, or even some lost language, since it is the name she brought with her from Mesopotamia. 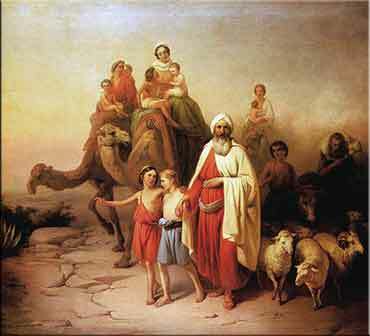 However, Abraham is sincerely concerned about his son, Ishmael. The phrase "that he might live before you" means that Ishmael might be blessed by God's favor and live in righteousness before Him, something Abraham would fervently (and understandably) desire for his son. God responds that He will indeed bless Ishmael to a large degree; but it is to be the second son, by Sarah, who will be the patriarch of the chosen people, with whom God will make his covenant. It might come as a surprise to many people that Abraham (Ibrahim in Arabic) is every bit as holy to Islam as he is to Judaism. This is where Ishmael becomes even more interesting, because Arabs believe that Ishmael was their patriarch, which is entirely consistent with today's Scripture; however, they also believe that Hagar was Abraham's true wife and it was this eldest son who received the blessing of Allah. In addition, they believe that Muhammed was the direct patrilineal descendant of Ishamael, much as Christians trace the ancestry of Jesus back to Abraham. Indeed, until we reach the split of Ishmael and Isaac, Islam and Judaism are startlingly similar.